Jodi, a realtor out of Sedona, AZ, contacted us a few months ago in regards to getting a website made to help market available lots and properties at a property development near Cottonwood, AZ. This property development is called Quail Canyon. Jodi paid the pre-payments right away, but had put the project on hold for a couple of months. Just about a week ago, she was ready to get started on the site. We worked closely with Jodi to get all of the pictures added to the site plus all of the documents and PDF files. Upon getting everything done, we went through several rounds of small changes and modifications to the website. Jodi now has approved of the website that we made for her, and was ready for it to go live. So it just went live today! Thank you for providing us with your business, Jodi, and we look forward to any other websites that you may need designed in the future! 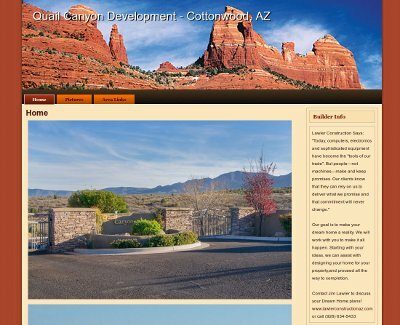 The website for Quail Canyon marketing is at quailcanyonaz.com.